Garage Museum of Contemporary Art presents an exhibition by Russian artist, writer, musician, and art theorist Pavel Pepperstein (b. 1966, Moscow). Introduced to the circle of Moscow Conceptualists as a child, since the beginning of his career Pepperstein has been one of the most prolific mythmakers in Russian contemporary art. He is an inventor of systems, universes, languages, cities, and political projects. Pepperstein’s solo exhibition at Garage reviews the key myths he has created since the 1970s: from imaginary countries for which he has developed detailed maps and national symbols to ecstatic or, on the contrary, ultra-logical visions of the future; from religions, cults, beliefs, and rituals to alternative realities that exist in parallel dimensions and modalities. The exhibition at Garage is organized as a sequence of galleries, each inhabited by a living and developing landscape or system. The Library features a collection of books invented by Pepperstein, which the visitor cannot open: only the spines are visible (book spines are key symbols for Pepperstein and Inspection Medical Hermeneutics, the group he co-founded with Sergei Anufriev and Yuri Leiderman). This is a new literary pantheon of European civilization with invented authors of pseudo-classics in place of Aristotle, Leibniz, et al. A large part of the exhibition presents Pepperstein’s “political discourse,” which encompasses a reinvention of the political system and the conversion of real political figures into symbolic ones, projected into the schizophrenic space of new utopias and meta-states of a new world. Pepperstein’s “political activity” began in the 1970s with the invention of utopian states and political systems, which he described in minute detail. His early drawings and the albums he produced as a teenager will be exhibited at Garage for the first time. The theatricalized exhibition design features a number of repeating elements, including patterns. In line with the practice of the Moscow Conceptualists, these patterns have a meaning deeper than mere “decoration.” Pepperstein believes that, in the words of Jacques Soulillou, “the purely decorative betrays a loss of roots. It has no genealogy, it is orphaned, and refers to a complete break with context.” The exhibition is driven by the playful exploration of various levels of reality, the search for magic and strange narratives in the folds of the real. It is transformed into a collection of wonderful landscapes, like the series of paintings from which the title is taken. For The Human as a Frame for the Landscape, Pepperstein will produce around twenty new works including drawings, videos, and installations. The first volume of his memoirs will be published to mark the exhibition. Pavel Pepperstein (b. 1966, Moscow) lives and works in Moscow. He studied at the Academy of Fine Arts in Prague from 1985 to 1987 and was one of the founders of the group Inspection Medical Hermeneutics (1987–2001). In 1989, he began to work as an independent artist, writer, critic, and rapper. Solo exhibitions include: The Future Enamored with the Past, Multimedia Art Museum, Moscow (2015); Pavel Pepperstein, Kunstmuseum Basel (2006); Gods and Monsters, Neuer Aachener Kunstverein, Aachen (2002); and Portrait of an Old Man (with Ivan Dmitriev), State Russian Museum, St. Petersburg (1997). Group exhibitions include: 1st Garage Triennial of Russian Contemporary Art, Garage Museum of Contemporary Art, Moscow (2017); Manifesta 10, State Hermitage Museum, St. Petersburg (2014); Ostalgia, New Museum, New York (2011); Russian Pavilion, 53rd Venice Biennale, Venice (2009); 26th São Paulo Art Biennial, São Paulo (2004); Moscow–Berlin / Berlin–Moscow, 1950–2000, Martin-Gropius-Bau, Berlin, State Historical Museum, Moscow (2003–2004); and Kunst im Verborgenen. Nonkonformisten Russlands 1957–1995, Wilhelm-Hack-Museum, Ludwigshafen am Rhein, documenta-Halle, Kassel, Lindenau-Museum, Altenburg (1995). He is the author of the books An Old Man’s Diet (1997), Mythogenic Love of Castes (1999), Spring (2010), A Prague Night (2011), and The Age of Theme Parks (2017). In 2014, he was awarded the Kandinsky Prize for Project of the Year. Кто вы во вселенной Павла Пепперштейна? Please note that Pavel Pepperstein. The Human as a Frame for the Landscape is open to visitors aged 18+. Please have a proof of identity on you. Thank you for your understanding. The public program for Pavel Pepperstein’s exhibition The Human as a Frame for the Landscape includes lectures, discussions, readings, screenings, and other events exploring various aspects of artistic imagination. Visitors will be introduced to psychoanalysis and dream interpretation, explore the worlds of the unconscious, and embark on art journeys. Events also include lectures on the history of Moscow Conceptualism, readings of Pavel Pepperstein’s memoirs that Garage is currently preparing for publication, and a show of designer clothes based on the artist’s drawings. Garage will also screen Sound of the Sun by Pepperstein and Natasha Nord, which premiered at the Moscow International Experimental Film Festival in 2016 and host a series of meetings with experts on Pepperstein’s work. Children and teenagers can attend new workshops with Garage’s tutors and learn more about Pepperstein’s art at family lectures. On the show’s opening day visitors are welcome to join a free excursion and become the first spectators to become acquainted with the universe of one of the most prolific myth-makers in contemporary Russian art. 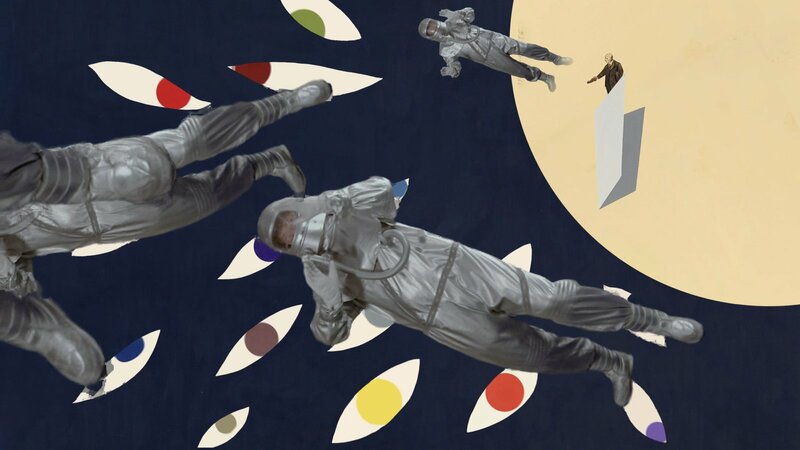 Psychoanalyst and film theorist Viktor Mazin and artist Pavel Pepperstein will discuss the influence of dreams on visual art and the psychoanalytical understanding of the reality of dreams.